The selection of “candidate items” is an important early step in LSA. The selected items will be the object of analysis in the framework of LSA. Successful selection of LSA candidates is essential for the success of the LSA process, keeping its cost and time schedule contained. LSA Commander’s Candidates Selection Module facilitates the identification of each part of the equipment that should be considered for further analysis through the performance of LSA tasks. 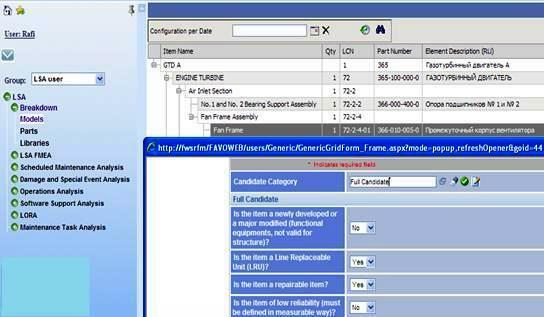 The Candidates Selection Module creates a list – Candidate Items List (CIL) that is maintained and updated throughout the different analyses in LSA Commander’s different modules and becomes a guide for ensuring that all support significant items in the equipment are properly addressed by the engineer.